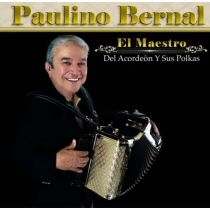 All Instrumental Diatonic Button Box Accordion with Paulino Bernal-This CD was Grammy® Nominated! This is a Grammy® Nominated Polka Album! This album is all original music with dynamite instrumental diatonic button box accordionist Paulino Bernal. Ask any true aficionado of Tejano Conjunto music about the greatest accordionists in the genre and maestro Paulino Bernal's name will always be on the short list. Yet, his name is unknown to many in the contemporary Conjunto audience because he walked away from a stupendously successful career in 1972, preferring instead to turn his music toward a Christian ministry. Despite his absence from the Conjunto scene, however, his legend persisted and his music continued to be emulated and admired by players and fans alike. Now, in 2008, Paulino Bernal will release his first instrumental recordings since the 1970s, El Maestro del Acordeon y Sus Polkas, and it is an historic return, indeed. The maestro with his trills, diminished chords, rapid fire delivery, incredible mastery of keyboard, and complete bellows control, has worked closely with producer (and accordionist himself) Armando Lichtenberger, Jr. of La Mafia, Bernal is seeking to preserve his music for future generations. And, since classic Conjunto is the essential underpinning of the modern sound, Bernal makes a profound contribution to both the history and contemporary reality of the Conjunto genre. This is the first mainstream recording in 36 years from co-founder of seminal Conjunto group Conjunto Bernal, the premier Conjunto of the 1950s and 1960s. Paulino Bernal exited the music industry in 1972 and dedicated himself to Christian ministry. El Maestro del Acordeon y Sus Polkas (The Master of the Accordeón and His Polkas) is aptly named: This recording includes new recordings of some of his biggest hits plus two new compositions, his first new polkas in three decades. His playing is remarkable, crisp and deft. This album is truly masterful work to be appreciated by fans and peers alike. The new CD which was recorded in December in Houston at Mafia Studios and produced by La Mafia producer Armando Lichtenberger Jr. contains 2 new polkas written by Paulino and 10 of his favorite melodies from throughout his career including his classic Idalia. The musicians on the recordings are his band Ernest Bernal Gonzalez (Bajo Quinto), Armando Hinojosa (Bass), Pedro Gonzalez Jr (Drums) and special guest James Arreola of Los Palominos (Bajo Sexto). Produced by: Armando Lichtenberger Jr.